Below are photos of the rooms and spaces at WITT, booked for the residency. The daily workshops will be happening there, and those who need space and equipment will work in the rooms. This is Taranaki maunga or Mount Taranaki. It can be seen from many but not all locations in New Plymouth Nga Motu. Everything happens in the shadow of the mountain. This is the exterior of F Block, which has the Art and Media rooms at one end and Te Wananga Maori (Maori department) at the other. This is the area in front of F Block. You can see the sea through trees that are out of shot on left of image. This is the main central area of F Block art rooms. One of the Art and Media room is this small Mac lab for editing video. Most of the campus is PC. This is – you guessed it – a dark room. We still actually have wet dark rooms on campus, unlike most other places that threw this stuff out. We have a print room for traditional print making as well. We have a small Photography Studio. We do need to get permission to use specialist rooms. There is a workshop area with heavy benches and power from above. We also have a Machine shop, but you must do the Occupational Safety and Health orientation before you can use anything. Our technician will be around 2 days a week. This is a seminar room off the main space. It has blinds and shutters to control light. This larger space is multi-use, like the main space. We use it for classes then clear it out for showing work. There is one more space, we call the wet studio, but there was a class in there and I didn’t want to disturb them, when I took these photos. The room has big sinks (think dishes). This page should be treated as speculative, as it contains some thoughts on positions of the works exhibited, but this needs now to be negotiated. Much is likely to change. The general shot above shows the level 2 main entrance. In the centre is the moa and kiwi. Some aims for the install are: 1. Mingling works with the Museum collection, opening dialogues to co-located spaces and objects. 2. Clustering works in groups, to make SCANZ exhibition works more apparent. 3. Having tours and a guide map to works. 4. High quality presentation and images are required for the Leonardo publication. The lighting conditions are suitable. Images less than really good will not be used. Above is the opposite corner of the level two display area. This is in the Taonga (Treasures) Galleries, which we have to ask special permission for. I’m suggesting that we project Mike Paulin’s work on the side of the sail in the centre of this photo. Above the signs is where we are considering putting Josh Wodaks’ images. Also in the Taonga Gallery. We plan to project Te Huirangi Waikerepuru’s work on a translucent screen, in the Taonga Gallery. This is the view of the gallery from just inside the entrance. Sonja van Kerkhoff and Sen McGlinn are proposing a spiral free standing structure and we are suggesting in the above area. Its at the top of the stairs. This is an option for Janet Laurence. There is an opportunity to engage with a range of subjects. This clearly is the native insect and bird life section, with a full moa skeleton and kiwi in cases. A clearer shot of the display cases in this area. This would be another option for Janet Laurence. This could also be as well. Its spectacular in a mundane sort of way. All the display cases have lights, some are dimmable. On one side of level 2, there are three cases in a row. We are thinking of the outside ones containing jellyfish by Anne Pincus and the middle containing the cyanobacteria by Hideo Iwasaki. One thing we are suggesting is to supplement some of the existing information in this area, which covers the period 65-21 million years ago, by including information about bacteria in this time period. Or single celled life forms if that is suitable. This is a front view of a case for jellyfish or bacteria. There is a large gate way towards the rear of this photo that is framed by blue panels. The left upright panel is a proposed position for Tracey Benson’s work, although this involves some negotiation, to see if hanging vertically rather than horizontally is OK. This is the right hand side of the blue gateway, and suggested for Kura Puke’s work. All positions do need positive responses from the artist and we can have one to one discussions to resolve any matters arising. This area is just around the corner from the blue gate way area above. It is proposed for the Galactic wind data project by Nina Czegledy and collaborators. Click here to register for the the SCANZ 2013 3rd nature wānanga-symposium. The link takes you to our official registration page at Lil Regie.com. This is a K1w1 site and simple to use, with payment options of credit card, Paypal or by invoice. We are encouraging everyone to register for the hui-symposium. It is important to us, because we will be basing catering requirements on registrations. There are 4 food and drink events on Friday (morning tea, lunch, afternoon tea and dinner) and 3 each on Saturday and Sunday (morning tea, lunch, afternoon tea), so that is a lot of catering to arrange. Registration includes dinner on Friday night at Owae marae, plus light lunch on Friday, Saturday and Sunday, plus morning and afternoon tea. That is 10 catering events. Register before December 14 2012 and the price is $345 (student/unwaged $245) for the three days. One day registrations are $120. Full registration is $395 (student/unwaged $295). One day registrations are $150. On the one hand the Friday night dinner is modest, but on the other hand it is a Wonderlogue event led by Trudy Lane, which involves interdisciplinary discussion. You can pay via credit card, Paypal or the system can send you an invoice. Symposium presenters and attendees should make their own accommodation arrangements. If you are not staying at Te Henui Lodge, and need a lift to Owae Marae on day one or Puke Ariki on day two, please let us know by emailing Thilani Nissanga. Go to: http://www.intercreate.org/scanz-2013-map/ for a map of SCANZ sites. There is a link to a larger view just below the map. This schedule has been placed online for discussion, it may need to change. Evening show and tell/social event? This schedule has been placed online for discussion. The plan is below. It is possible it has to change. Curatorial partners for SCANZ 2013. Aotearoa New Zealand’s leading contemporary art gallery. Site of the SCANZ 2013: 3rd nature exhibition, opening dawn Saturday February 2nd 2013. A botanical park and garden in central New Plymouth, which is being outfitted with wifi. It is also the location of SCANZ and Intercreate projects. http://wittart.co.nz – the Department of Art, Design and Media at WITT webpage. The department has a large central space with some good walls for showing work, (follow links to ‘panorama’ at wittart.co.nz) with teaching rooms, painting room, fully equipped workshop (OSH guidelines apply), wet and dry darkrooms, Mac editing suite, printmaking studio. We have access to large format printers but this is by application. So if there is specialised equipment sought please contact us early to request it and we will try and help out. OSH guidelines mean only trained operators of machines can use equipment. Even if you have certification, you would still need to do the induction for the specific machines. For residency artists particularly, we recommend Te Henui Lodge. The lodge consists of two buildings, which were formerly student halls of residence, now run as a stand alone business. Consequently they are practically on the WITT campus, which is the site of the residency. They are clean, have good wifi and the building for short term stay (which is where SCANZ people stay) is going to be refurbished according to the new owners. The room rates are the most competitive. Prices are around $60 per night for a single room, $70 per night for twin/double. Weekly rates are $180 for a single, $220 for a twin/double. Residents stay 17 nights from Jan 18 check in to Monday 4 Feb check out, and that means that three weeks applies, so total is $540 single, $660 for a twin/double. There is also the Plymouth Hotel. This is an international standard hotel, which is in walking distance (10-15 minutes) of WITT campus. Room rates vary from $110 – $390 per night, and this depends on the time of travel. Sunflower Lodge is a backpackers type accommodation, and quite nicely set close to bush. It is relatively new, and again close to WITT. They ask that people inquire to get room rates. There are dorm, twin/triple, single and double room options. These three intersecting dialogues provide space for a Third Nature, a fresh space for engaging with new knowledge and approaches vital to a sustainable civilisation. We are asking residents to arrive in New Plymouth by Friday 18th January. This is to allow us to leave early on the 19th, for Parihaka. This marae was the location of an important passage of peaceful resistance led by Te Whiti and Tohu, leaders of the Parihaka community in the colonial period. We are happy for people to arrive earlier. Some of the organisation team will go to Parihaka on the 18th, in accordance with protocol. The 18th of each month is a day in honour of Te Whiti and the 19th of each month is in honour of Tohu. There are only four or five flights per day to New Plymouth. If you land in the international terminal at Auckland you then need to take the free bus to the domestic terminal, or you can walk following a green line, which takes about ten minutes. Wellington also has a separate international terminal – I haven’t used it but imagine all processes are similar. Air New Zealand is the only airline servicing New Plymouth (Nga Motu). Locate the Air New Zealand check in kiosks. Checking in is done by you at the kiosks, and there are staff to assist. You then drop your bags on to the conveyor (again someone assists). At Auckland Airport you then need to go to the regional airlines waiting area. Don’t be surprised to see large flight boards with no mention of New Plymouth flights. These are located in the area for departures and arrivals for the main centres. The regional airlines departure area in Auckland is at the left end of the domestic terminal when standing outside and facing toward the doors. When your flight boards, you’ll walk quite a way to get to the plane, and the plane is quite small. When your flights are arranged, please give the arrival and departure information to Thilani Nissanga. Thilani is our administrator. In the lead up to SCANZ she will be looking after arrival, departure and accommodation information. During SCANZ she will be staffing an admin office for queries, mainly during normal business hours, 9-4.30. It takes around 5 hours to drive to New Plymouth, either from Auckland or Wellington. It depends on how long the breaks in the journey are and also how heavy traffic is. Some cars will no doubt be driving from Auckland around the 18th. For car pooling queries please contact Thilani. For those arriving internationally, we recommend the flight to New Plymouth. If you would like to go by car, we probably need to add an overnight stay (it is very tricky to arrange an incoming international flight arrival with a pick up in time to get to New Plymouth on the 18th), which means you would need to arrive at least a day earlier. One of the reasons we say to check out Monday 4th February is that there are no late flights on Sunday night from New Plymouth. The last flight is around 7.15, so rather than rushing around on the final afternoon, it is simpler to leave the following day, checking out in the morning. Day one of the hui symposium is at Owae Marae. We will be leaving early on Friday February 1st for the marae as there will be a powhiri when we get there. There is not really time to fly to New Plymouth and make it for the start of the powhiri. Anyone driving would need to leave Auckland or Wellington at 3.30am to make it for the powhiri. Powhiri is the protocol of welcoming visitors onto a marae. 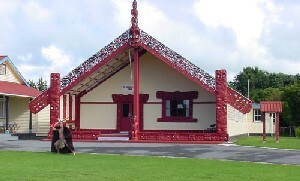 The marae consists of a Whare Nui (Meeting House) and a Whare Kai (Eating House) plus a number of other buildings. We will be called on to the marae, by women (wahine), one calling for the locals (tangata whenua), one for the visitors (manuhiri). At the threshold of the Whare Nui, there will be a hongi for some (pressed nose greeting where the breath is shared). Once inside, several people will speak – some for the tangata whenua, some for the manuhiri. After each speech, there is a song. The formal ceremony is concluded and then all are welcome to speak, in particular any women who may like to speak. Owae Marae is progressive in that it is Ok for women to speak. Traditionally, women did not take part in this aspect of proceedings. So please take up this opportunity if you get the feeling to. Presentations for day one should be those that do not require internet access, as we have had problems in the past with reliability. A projector will be available. Day two of the symposium starts with the dawn opening of the exhibition at Puke Ariki. We will have two vans to take people to the opening. Such openings are rare, even in Aotearoa New Zealand so everyone is encouraged to attend. We will have an extended mid morning break so everyone can freshen up. The remainder of the day is at WITT. The following day, Sunday starts at WITT and proceeds to Pukekura Park. While not strictly necessary, we encourage hui symposium attendees to leave on Monday. This allows some ‘slow down time’ after the events of the previous few days. It is also our intention, that those putting forward papers, are able to have their paper impacted by attendance at the hui. Consequently scheduling reflective time is advised. Making a few notes at the time makes paper editing and development that much quicker. That said, it would be possible to leave by car around 4.30pm on Sunday and arrive in Auckland or Wellington around 9.30pm. Similarly flights from New Plymouth airport could be booked. Korou Productions is currently in the first phase of research and consultation for Ūkaipo – A new dance opera in Te Reo Māori. SCANZ 2013 will be an welcome opportunity for the Ūkaipo kaupapa to connect with mana whenua and tangata whenua of the Taranaki rohe and attending interdisciplinary artists and scientists. Ūkaipō Celebrates the divine feminine, the mother nurturer; mother nature. In exaltation of the natural realms of Papatūānuku and Ranginui where earth meets sea and sky, we honour the sacredness of water, our relationship to the South Pacific, distant homelands of Hawaiki and new horizons. Cloaked in a korowai of sacred forest we re-connect to ancient consciousness in a new form. Toitū te whenua, whatungarongaro te tangata. Papatūānuku calls for tremendous healing. Mankind continues to use the provisions of Papatūānuku in excessive amounts. People live and die, disappear, but land remains, what state are we, the current generations leaving our lands for future generations? Ūkaipō Births a new art form, merging the traditional vocal genre of classical and Avant-Garde Opera, in Te Reo Māori with contemporary Māori dance theatre. Envisaging the earthy creation of Rangi Mareikura: Heaven of the adorned sweet voiced singers. Ūkaipō moves toward creating a celestial experience to affirm our physical, spiritual and intellectual interconnectivity with our intact but remnant environment. Ūkaipō Will work within Māori and Tauira communities that promote environmental care and wish to expand their stories and their messages of resilience, conservation and sustainability. Ūkaipō Will engage with allied art forms and artists that desire to share in the holistic and conscious approach to this new work including fine artists, body painters and special effects, sculptors, creators of taonga, adornment makers, glass workers and multi-media and computer graphics design. Ūkaipō Is to be the first of its kind specifically designed to actively encourage a dedicated team of professional artists to engage in a Dance Opera in te reo Māori, and through wānanga outreach to communities in Aotearoa – both Rural and Urban. Ūkaipō Is currently in Phase One Research supported by Creative NZ Te Waka Toi Arts Grant 2011.